From a business relationship to a dynamic husband and wife duo, franchise owners Todd and Virginia Holding are a force to be reckoned with. As two former college athletes turned fitness enthusiasts, the Holdings have a clear drive that led them to owning two Workout Anytime locations in the Atlanta area. With a combined experience of 45 years in the fitness industry, Todd and Virginia took what they learned from their many years working at LA Fitness and several other companies and implemented them into the Workout Anytime model they felt would be most successful. With both running highly profitable personal training businesses along with other vast experience in the fitness world, Todd and Virginia knew how to run a fitness business. Despite that, they did thorough research prior to joining Workout Anytime as owners, beginning with working in thirteen Workout Anytime locations. In 2013, they joined the model with partners. Since then, they have opened Eastlake and Town Center and implemented their best practices to find success with Workout Anytime. Todd and Virginia, with their diverse background in the fitness industry, saw Workout Anytime as the perfect model for them as “Workout Anytime was turn-key and the model succeeded everywhere we went. We knew that with our experience, and putting it into our own Workout Anytime, we would be very successful.” More than just the success of the model, however, Todd and Virginia were drawn to Workout Anytime’s sense of integrity. They struggled against previous companies who did not have the same sense of integrity that Todd and Virginia did. Ultimately, that fact led them to the desire to open their own business within a company who would not only allow them to run their business in an honest manner, but actually promoted it. With two thriving clubs, Todd and Virginia are not done building their legacy within Workout Anytime. They plan to open more than ten clubs within the Workout Anytime Nation “to provide a bigger opportunity for our teams to grow and have rewarding careers with us.” And with 4 kids of their own, Todd and Virginia want to create a lifestyle for themselves that will take care of their own family. They believe that with “work ethic, discipline, and (our) high standards for running good clubs for our members and for our teams . . . and the discipline of doing whatever has to be done until it’s ‘right,’” they can achieve the success to which they aspire. Todd and Virginia joined Workout Anytime nine years ago when only ten locations existed. Now, with over 130 locations in twenty-one states, they are excited about the growth of the company as a whole, stating, “it’s clear they have re-invested a tremendous amount of time, effort, and money into Workout Anytime and their franchisees . . . (they) have always tried new and different things. Some worked, some didn’t, but they aren’t successful by accident. It takes this to continue to be successful or you become obsolete. 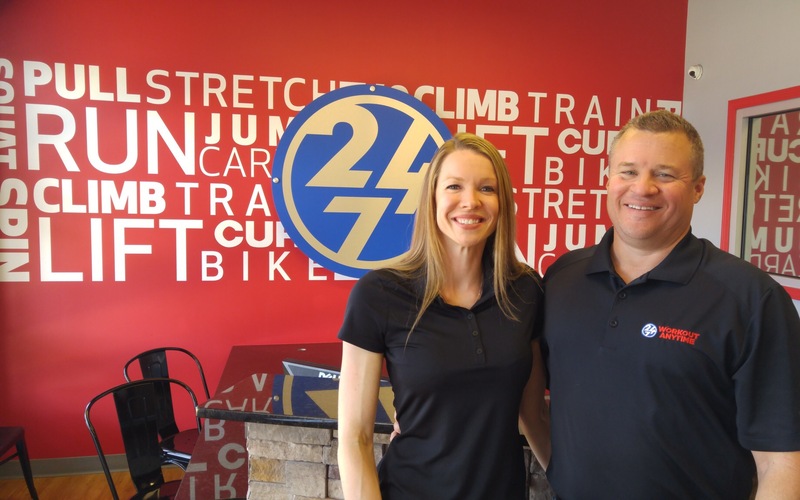 It’s gone from just a few franchisees to a growing brand to be really proud of and a Workout Anytime family.” We are proud to have Todd and Virginia as a part of this strong Workout Anytime family and are excited as they continue to grow along with us.